Best for: All Preperation time: 1/2 Hour. 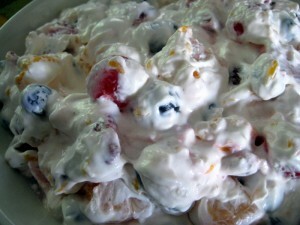 Creamy Fruit Salad recipe by Sajida at DesiRecipes.com. Oranges(peeled & skin removed) 45. Slice the apples into thin rings without removing the skins. Sprinkle lemon juice at once over bananas & apples to prevent discoloration. Take out pineapples from syrup. Remove stones from cherries & cut in half. In a glass dish, layer the fruits except cherries. Keep the cherries for the top. Sprinkle sugar on each layer of the fruits. Then pour pineapple syrup over the fruit layers carefully. Cover the dish tightly & chill in the freezer overnight. Serve with cream which is presented separately in a bowl. Any other fruits in season as peaches, plums, grapes or mangoes may also be used. do u mean fridge or is it actually suppose to go in the freezer..?